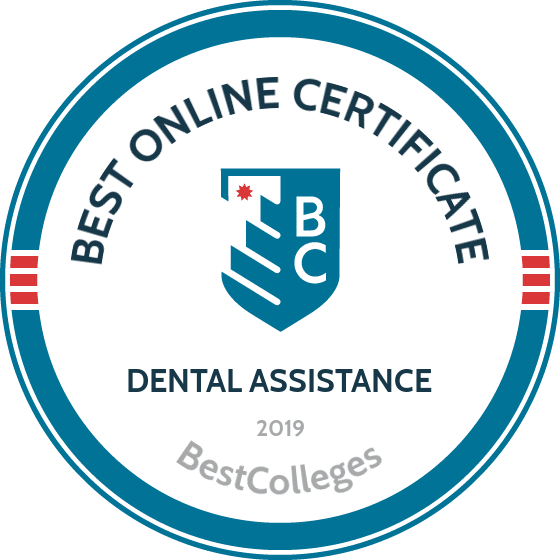 What Are The Best Online Certificate in Dental Assistance Programs? What Else can I Expect From an Online Certificate in Dental Assistance Program? What Can I Do With a Dental Assistant Diploma? Dental assistants prepare patients for treatment, sterilize tools, and assist dentists during procedures. Online dental certificates are a flexible way for working professionals to enter or move up in a high-demand field. Dental assistant certificate online graduates make a median salary of $37,040, with the top 10% earning more than $52,000. Dentists often hire more than one dental assistant. This allows them to see more patients in a day, and most dental assistant positions are full time. As the large baby boomer population ages and health professionals continue to stress the importance of good dental hygiene, the demand for trained professionals will continue to grow. The field is projected to grow 18% from 2014 to 2024, which translates to more than 50,000 jobs. Indiana University-Purdue University is a public research university located in Indianapolis. The school promotes sustainability, community engagement, and economic development. Offered by the School of Dentistry, the dental assistant certification online program at IUPUI consists of lectures, laboratory classes, and clinical instruction. Notable classes in the curriculum include oral histology and embryology, oral pathology, dental therapeutics, and microbiology. Distance learners must complete 300 clock hours of clinical practice in local community dental offices. Although nonclinical coursework is completed online, online learners must travel to the IU campus one weekend per month throughout the duration of the school year. This full-time, distance-learning program prepares students to sit for the Dental Assisting National Board examination. As a flexible program, distance students can complete coursework at their convenience. Online work includes reading, writing, and video assignments. The dental program can be completed in two semesters. Distance learners enjoy small class sizes with only 12 other students. The program is an ideal stepping stone for individuals who want to pursue a bachelor's degrees. Several programs at IUPUI accept dental assisting course credits. Applicants must hold a high school diploma or GED with an overall cumulative minimum 2.0 GPA. Prospective students must identify a sponsoring general practice dentist with an active Indiana dental license to provide clinical training, and observe a supervising chairside dental assistant for at least eight hours. The dentistry program is fully accredited by the American Dental Association Commission on Dental Accreditation. Indiana University-Purdue University is accredited by the Higher Learning Commission. Rutgers University is a comprehensive public research university located in northern New Jersey. Home to 300 research centers and institutes, the school is committed to cutting-edge research and public service. Offered by the Center for Continuing Professional Development within the Division of Continuing Studies, the administrative dental assistant certificate program is ideal for individuals eager to manage the business aspects of dental practice. This program covers administrative dental duties such as scheduling patients, maintaining records, insurance billing, and managing reimbursements, and spans topics including patient care, dental anatomy, and disease-prevention fundamentals. This program prepares graduates for entry-level positions in dental offices. Notable classes in the curriculum include interpersonal and communication skills, records management, financial management, and scheduling and recall systems. Students receive comprehensive instruction with DENTRIX, including DENTRIX G4 modeling software. The software required for this self-directed program is not compatible with Apple products. Rutgers' dental program is ideal for those who need maximum flexibility. With no on-campus or internship requirements, distance learners can earn their certificates entirely online. As a self-paced program, online students take classes when it is most convenient for them. Students can finish this 150-hour program in six months. Rutgers offers distance students access to many online tools, videos, and library resources. Prospective students do not need any dental office work experience. Textbooks are included in the cost of tuition. Rutgers University is accredited by the Middle States Commission on Higher Education. The University of Georgia is a top public research university located in Athens. Founded in 1785, UGA is the state's oldest institution of higher education. Offered through the Center for Continuing Education and Hotel, UGA's dental assistant certification online program teaches students many aspects of dental office work. Students in this program learn dental terminology, oral anatomy, medical records management, accounts receivable, insurance billing, and patient scheduling. Topics also cover procedural and diagnostic coding, and reimbursement management. Online learners receive comprehensive instruction with DENTRIX G4 software, and gain strong communication and interpersonal skills. UGA's dental program consists of 15 continuing education units, which can be completed in approximately 150 hours. Students must finish the program in six months. Online classes are delivered through ed2go. Classes are taught by a registered dental assistant and dental hygienist. While prospective students do not need any dental office work experience, they should have a basic understanding of a word-processing computer program such as Microsoft Word. Applicants can register online and begin at anytime. This program is ideal for individuals seeking a new healthcare career in a dental office. Continuing education students at UGA may be eligible for financial assistance, such as military funding, AmeriCorps vouchers, and Workforce Innovation and Opportunity Act federal training dollars. Textbooks are included in the cost of tuition. The University of Georgia is accredited by the Southern Association of Colleges and Schools Commission on Colleges. Founded in 1820, the University of Alabama is the state's first public college. The school has a commitment to teaching, research, and service. UA's administrative dental assistant certification online program is offered through the College of Continuing Studies. This dental program ensures students have the skills necessary to manage a dental office. Coursework covers dental terminology, reimbursement management, medical records management, accounts receivable, dental insurance, and procedural and diagnostic coding. Topics also include bookkeeping and collection procedures, inventory management, and equipment maintenance. Students discuss various telephone techniques, and gain skills in written correspondence, teamwork, and communication. This certificate program provides students with DENTRIX software and opportunities to practice interacting with patients professionally, scheduling appointments, and answering billing questions.. This program is a great option for those considering embarking on a new professional path. UA's certificate program consists of 150 hours of continuing education coursework. Classes are delivered through ed2go by a registered dental assistant and dental hygienist. Students are not required to come to campus at any time. Prospective students must have basic computer skills, keyboard proficiency, and an understanding of a word-processing program such as Microsoft Word. With open enrollment, students can register and begin the program at their convenience. Students at UA are encouraged to apply for college loans. Ed2go offers financial assistance for military members. The University of Alabama is accredited by the Southern Association of Colleges and Schools. Located in downtown Troy, Hudson Valley Community College is a State University of New York College. The school is sponsored by Rensselaer County. The dental assistant certification online program at HVCC is housed in the Dental Hygiene Department. The program ensures graduates understand both patient care as well as the administrative duties of a dental assistant. Students learn how to set up dental materials, sterilize instruments, take and develop x-rays, schedule appointments, coordinate financial arrangements, and handle insurance claims. Notable classes in the curriculum include dental anatomy and embryology, dental assisting radiology, and oral hygiene education and nutrition. Students also take communication and public speaking courses, wherein they learn best practices for reducing patient anxiety. Designed for individuals pursuing entry-level employment within the dental industry, this program includes 27 credit hours of online coursework, plus a clinical internship. Students earn 225 hours of hands-on clinical experience made up of 90 clinical hours in the fall semester, and 135 clinical hours in the spring. This program satisfies the requirements needed to sit for the professional dental assisting exam, the radiation health and safety exam, and the infection control exams. Graduates are eligible to become licensed registered dental assistants in New York. Prospective students must hold adult, child, and infant CPR certification for health professionals through the American Heart Association. Students can begin in the fall semester. Full-time students can complete the program in one year. Hudson Valley Community College is accredited by the Middle States Commission on Higher Education. Southeast Community College is a public, two-year institution of higher education located in Nebraska. The school has campuses in Beatrice, Lincoln, and Milford. The dental assistant certification online program at SCC consists of coursework, laboratory experiences, and pre-clinical instruction. Topics cover chairside assisting skills, laboratory procedures, coronal polishing, and radiation exposure and processing. Students gain specialized skills in office procedures and management. Classes in the curriculum include oral sciences, dental ethics and jurisprudence, oral hygiene, radiography, and dental materials. In this program, students receive more than 300 hours of clinical experience at pre-approved dental offices and clinics. Graduates are eligible to take the certified dental assistant exam in Nebraska. This full-time program can be completed in one year. SCC recommends that prospective students take courses in anatomy, biology, and chemistry. Specific prerequisites for this program include nutrition, introduction to psychology, interpersonal relations, human communications, public speaking, and business and professional communication. Applicants must hold a high school diploma or GED and a minimum 2.5 GPA in general education courses. Prospective students must submit a professional resume, a 250-word essay, and proof of current CPR for healthcare providers from the American Heart Certification. Applicants must meet with the program adviser and complete placement testing or submit recent test scores. Admitted students begin in October or April. SCC's dental assisting program is accredited by the American Dental Association Commission on Dental Accreditation. Southeast Community College is accredited by the Higher Learning Commission. Located on the banks of the Mississippi River, the Eastern Iowa Community College District includes Clinton, Muscatine and Scott Community Colleges. The district is dedicated to high-quality education and training that prepares students to enter the workforce. The administrative dental assistant certification online program at EICC is ideal for individuals who want to manage the business aspects and operations of a dental office. Coursework dives into bookkeeping and collection procedures, scheduling appointments, procedural and diagnostic coding, inventory management, and recall systems. Students take classes in financial management, and gain skills in fee collection, accounts payable, accounts receivable, insurance billing, and reimbursement management. Topics also cover dental terminology, oral anatomy, and symptoms of illness and disease. Graduates of this program gain strong communication and teamwork skills. In this 150-hour certificate program, students practice dental assistant work with DENTRIX G4 software. Classes are delivered via ed2go. Students need Windows XP or newer, Adobe Flash Player. and Adobe Acrobat Reader. This program is not compatible with Apple products. As a self-paced certificate program, online learners take courses when it is convenient for them, keeping in mind students have six months to complete the program. Textbooks are included in the cost of tuition. Prospective students must have basic computer skills and typing proficiency. No dental work experience is needed. Ed2go offers military financial assistance. Eastern Iowa Community College District is accredited by the Higher Learning Commission. California State University San Marcos is a public university located in northern San Diego County. The school is dedicated to preparing leaders, building community, and solving critical issues. Through a partnership with World Education, CSUSM's dental assistant certification online program is an extended learning enrichment course designed to help students sharpen their professional skills. Topics span the history of dentistry, and the industry's legal aspects. This program introduces students to primary and permanent tooth structure, dental operatory, and dental equipment. In the oral anatomy course, students discover the location and function of nerves and muscles in the mouth. Students learn to prepare tools and sterilize dental equipment. This program ensures students are proficient at assisting with oral surgery, including recording observations and results. In this program, students have the option of completing a clinical externship at a local dental care provider. Courses are taught by certified facilitators. Students can enroll and begin this entirely self-paced program at any time. The program can be completed in six months. The cost of the dental assisting national board's radiation health, safety and infection control certification exams are included in the program tuition. Tuition also covers the cost of a comprehensive dental assisting textbook. Many online CSUSM programs are eligible for financial aid. Prospective students should check with the school's registrar's office. California State University-San Marcos is accredited by the Western Association of Schools and Colleges Senior College and University Commission. Founded as a trade school in 1912, Madison Area Technical College has since grown into a public technical and community college. The comprehensive institution is dedicated to innovative, high-tech career programs and college transfer opportunities. Madison College offers more than 150 career programs. Housed in the School of Health Education, the dental assistant certification online program at Madison College is a hybrid program consisting of online and in-person courses. Topics span chairside dental assisting, laboratory procedures, processing radiographs, and assisting with dental emergencies. Notable classes include dental health safety, dental materials, dental anatomy, and dental radiography. Students in this program compete a one-credit clinical lab course, and a two-credit clinical occupational experience course. Coursework covers administrative dental office work and inventory management. The program requires 16 credits to graduate, and most online courses run for 16 weeks. Students can earn their dental assistant technical diploma in one semester. Graduates are prepared for careers as chairside assistants, laboratory assistants, receptionists, and claims approvers. Applicants must submit a high school transcript and proof of healthcare provider CPR certification. Madison College uses a petition process for admissions and enrollment. Prospective students must be admitted on pre-petition status and then complete the dental assistant petition requirements. Prerequisites include algebra, and chemistry or biology competency. Prospective students must attend an academic information session prior to enrolling in the program. Admitted students begin in the fall or spring semesters. Madison College encourages students to apply for financial aid. Madison Area Technical College is accredited by the Higher Learning Commission. Sinclair Community College is an affordable, two-year institution located in Dayton, Ohio. The school prioritizes alignment with the economic and social needs of southwestern Ohio citizens, communities, and businesses. Sinclair offers a hybrid short-term technical certificate for dental assistants that introduces students to the fundamentals of dental assisting. Topics cover four-handed dentistry, oral examination, oral evacuation, and infection control procedures. Classes include dental assisting terminology, office management, radiography, and interpersonal communication. In this program, students learn how to identify, sterilize, and use dental instruments and equipment. They practice taking patients' medical and dental histories, and learn how to effectively and professionally communicate with patients and other healthcare providers. Learners gain skills in ethical decision-making and critical thinking. Coursework is offered online, however, students must travel to campus for lab work. The program is 17 credit hours, and courses must be taken in a designated sequence. Class size is limited to 18 students, and are taught by highly skilled professionals. Graduates are eligible to sit for the Ohio state certified dental assisting examination. Applicants must submit a high school diploma or GED and possess a minimum 2.0 GPA. Applicants must complete the SCC distance learning course, and be approved for admittance from the Dental Health Sciences department. Prospective students are encouraged to take CPR for healthcare providers prior to enrollment. Admitted students must attend a mandatory on-campus orientation. Students enroll on a first-come first-placed basis and begin in the spring semester. Sinclair Community College is accredited by the Higher Learning Commission. Established in 1990, Ozarks Technical Community College is located in southwest Missouri. The school offers affordable, accessible educational opportunities. OTC's dental assistant certification online program provides a foundation in the health sciences. Courses include chairside assisting, dental science and health, infection control, dental radiology, operative dentistry, and dental materials. Students take classes in office procedures, communications, and receive training in dental technology to ensure technical proficiency. In this program, learners gain real-world experience working alongside dentists during a practicum. Coursework is aligned with the Missouri Dental Board State Dental Practice Act. OTC prefers students take classes in a set sequence. Graduates are eligible for an expanded function permit through the Missouri Dental Board, and are also eligible to sit for the Dental Assisting National Board exam to become a certified dental assistant. This program readies students for careers as chairside assistants, oral surgery assistants, office managers, laboratory assistants, and orthodontic assistants. As a hybrid program, students take classes online, but travel to the Dental Hygiene Clinic on the Springfield campus for face-to-face laboratory and clinical work is required. Prerequisites include english, natural sciences, mathematics, and American politics. Applicants must submit a general and allied health application. Prospective students must complete pre-admission testing and 40 hours of clinical observation work. Applicants must attend a dental program informational session on campus. Admitted students begin in October. The OTC Dental Assisting program is accredited by the Commission on Dental Accreditation. Ozarks Technical Community College is accredited by the Higher Learning Commission. Founded in 1890, North Carolina A&T State University is a historically black research university located in Greensboro. The public school is committed to excellence, collaboration, and global outreach. N.C. A&T offers a dental assistant certification online program in conjunction with Health Ed Today, an online healthcare education provider. Key areas of study include clinical dentistry, dental operatory, dental equipment, infection control, and prevention of dental disease. Students learn about oral anatomy, dental physiology, tooth structure, tooth charting and surfaces, and classification of restorations on a tooth. Coursework covers the history of dentistry and the dental assisting profession, and the legal aspects of dentistry. Students learn about dental radiology, coding services, and how to use CD-10-CM codes. Learners become familiar with administrative duties and gain strong communication skills. This self-paced dental assisting program las six months, and requires 60 hours of study. Graduates of this program are eligible to sit for the Dental Assisting National Board radiation health and safety and infection control exams. This program is ideal for individuals pursuing an entry-level administrative position, with a future in a dental hygienist program. Online learners complete interactive learning modules, and have 24/7 access to mentoring, learning exercises, and career resources. Applicants must hold or be pursuing a high school diploma or GED. Tuition covers textbooks and related course material. North Carolina A&T State University is accredited by the Southern Association of Colleges and Schools Commission on Colleges. Monroe Community College is a State University of New York located in Rochester. The public community college values opportunity, innovation, and excellence. MCC's online dental assistant program is a rapid track certificate (D.A.R.T.) designed for working dental assistants wanting to advance their careers to the next level. The curriculum covers clinical training and didactic education surrounding chairside assistance, dental material manipulation, radiographic techniques, and state-regulated infection control procedures. Students learn to take patients' preliminary medical histories and vital signs, place and remove rubber dams, select provisional crowns, prefit orthodontic bands, remove orthodontic arch wires and ligature ties, take impressions for study casts, remove sutures, apply topical anticariogenic agents and desensitizing agents, and take dental x-rays. Students discuss the legal and ethical aspects of dentistry as well as oral histology, embryology, pathology, and therapeutics. MCC D.A.R.T students must earn a minimum of 500 hours of clinical experience under the sponsorship of a practicing dentist. The program is offered entirely online and requires 15 credit hours. Graduates have strong oral and written communication skills. Applicants must hold a high school diploma or GED and have CPR certification. Prospective students must already be employed as dental assistants and have a designated dentist as a sponsor. Monroe Community College is accredited by the Middle States Commission on Higher Education and a member of the League for Innovation in the Community College. Middlesex Community College is a public, two-year institution located in Middletown, Connecticut. The school is committed to accessibility, diversity, and sustainability. MXCC's administrative dental assistant certification online program is offered in conjunction with ed2go. This certificate program ensures students understand how to manage the business aspects of a dental practice. Topics cover information and medical records management, recall systems, dental insurance procedures, inventory management, and equipment maintenance. Students discuss the financial aspects of working as an administrative dental assistant, including bookkeeping, collection procedures, accounts receivable, and accounts payable. Coursework teaches students proper dental terminology and anatomy, as well as patient billing and scheduling. Students learn to communicate effectively, relate to patients in a professional, caring manner, and work well on a team. This certificate program is an ideal option for individuals pursuing an entry-level career in a dental office. MXCC's dental program is self-paced and offered entirely online. Students have six months to complete the 150-hour training. Online learners have access to a registered dental assistant to answer questions and help with coursework. This online program is not compatible with Apple products. Prospective students do not need office dental work experience. Individuals who wish to enroll in this program must have proficient computer skills, including keyboarding and word processing. As an open enrollment program, students can register and begin the course at any time. Textbooks are included in the cost of tuition. Ed2go offers military financial assistance. Middlesex Community College is accredited by the New England Commission on Higher Education. The second-oldest of the nine state colleges and universities in New Jersey, William Paterson University of New Jersey is a public university located just north of New York City. The school was founded in 1855 and roots its values in academic excellence, creating knowledge, student success, diversity, and citizenship. Offered through the School of Continuing and Professional Education, the dental assistant certification online program is a comprehensive course that covers both administrative and clinical dental assisting. Key areas in the curriculum include dental policies and guidelines, dental operatory, and dental equipment. Students discuss dental radiology, coding of radiology services, and the use of ICD-9-CM codes. Topics span the legal aspects of dentistry, and the history of dentistry and dental assisting. Coursework covers oral and jaw anatomy, dental physiology, tooth structure and surfaces, tooth charting, oral health, disease prevention, and infection control. Students learn how to identify and sterilize dental equipment, and classify tooth restorations. WPUNJ dental program graduates are eligible to sit for the Dental Assisting National Board radiation health and safety exam, and the infection control exam, and pursue entry-level positions in dental assisting. This program is also an ideal stepping stone for those who may wish to pursue a dental hygienist program in the future. There are no prerequisites for this program. With open enrollment, students can register and begin classes at anytime. William Paterson University of New Jersey is accredited by the Middle States Commission on Higher Education. Dental assistant certificate programs online share many similarities. Courses will vary between schools, but the list below will give you an idea of what courses you can expect to take. Oral Anatomy: Students are introduced to anatomy as it pertains to dental and orthodontic work. They learn the location and function of nerves, muscles, and other structures found in the head, neck, and face. Facial and oral anatomy is an essential course. Oral Radiology: This course teaches aspiring dental assistants how a dental x-ray unit works, and how to operate one. Students learn about the components of the x-ray unit and about safety precautions and the history of radiology. Taking x-rays is one of the primary jobs of dental, orthodontic, and oral surgery assistants. Chairside Assisting: Students learn how to assist dentists with procedures. Learners are introduced to dental equipment and instruments and learn how to perform four-handed procedures. These courses often cover chairside assisting in surgical, orthodontic, and dental settings. Dental Materials: This course covers dental instruments and the ways in which they are typically organized in an office. Students are instructed on the various types of dental equipment and their uses. The course also provides instruction on the types of glues and cements used in dental work and the role a dental assistant plays in working with these materials. HOW LONG DOES IT TAKE TO GET AN ONLINE CERTIFICATE IN DENTAL ASSISTANCE? If you are interested in completing a dental assistant certificate program online, you should consider how much time you are willing to commit to earning a certificate. It can take between six months and one year to complete a certificate program. Some programs are hybrid, meaning they require on-campus visits for labs and demonstrations. The schedule and flexibility of these visits can affect the amount of time your program will take. Some dental assistant certificate programs are individually paced, while others are taught through a cohort learning format. Individual programs allow you to complete courses and assignments at your own pace. Cohort learning programs require that you work at the same pace as the rest of your class. There are benefits to both types of learning, but cohort programs typically take longer to complete. A certificate or diploma is a great way to acquire job training that will quickly prepare you to enter the workforce. A degree is generally more expensive and takes more time to complete than a certificate or diploma. Degrees typically include coursework that is not career-focused. Diploma and certificate programs are best for students who do not plan to pursue higher education. Completing a dental assistant certificate program does not mean that you have to pursue a career as a dental assistant. A certificate in dental assistance opens the door to a variety of career paths. Graduates are prepared to work alongside dentists, orthodontists, and oral surgeons. Dental assistants prepare patients for dental work and assist dentists during procedures. They play an essential role in any dentist's office by providing assistance during complicated procedures and by doing some administrative work. Orthodontic assistants take x-rays and impressions and prepare patients for the orthodontist. They help out during procedures and clean and organize equipment. Oral surgery assistants do similar work to dental and orthodontic assistants, but in a surgical setting. They prepare the patient for surgery and sterilize all necessary instruments. They also assist during procedures and make sure the patient leaves with all the information they need. Some students who finish their dental assistant certificate online choose to continue their studies to acquire more training, which increases their earning potential. Dental hygienists earn an average of around $67,000 per year, nearly double what dental assistants make. Credits from dental assistant certificate programs online may transfer to associate programs in dental hygienics. Associate in Dental Hygiene: Dental hygiene students learn about oral hygiene and health and how to perform certain procedures. Dental hygienists clean teeth and gums and administer local anesthesia. Accreditation ensures that your degree, certificate, or diploma meets certain standards. If a school is accredited, that means it has passed a rigorous academic review process. Some programs are regionally accredited, while others are nationally accredited. Traditional four-year universities are typically regionally accredited, while career-focused schools are usually nationally accredited. Popular accrediting agencies specific to the dental field are the Commission on Dental Accreditation and the American Dental Association Commission on Dental Accreditation. It is important to ensure that your program and school is accredited. The Council on Higher Education Accreditation's website includes a database of accredited schools. If you are interested in completing a dental assistant certificate online, it is important to compare tuition rates. While dental assistant certificate programs online are not as expensive as degrees, they are still a financial burden. Fill out the Free Application for Federal Student Aid (FAFSA) to find out if you are eligible for federal financial aid. There are also scholarship opportunities available. The American Dental Association Foundation offers $850,000 in grants and scholarships each year to dental students.